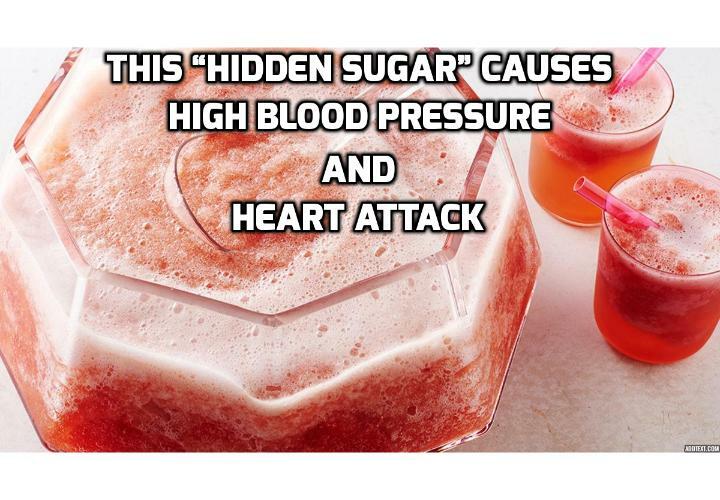 What are the Hidden Sugar that Can Cause High Blood Pressure and Heart Attack? I’m sure by now you are well aware that poor diet habit such as having too much sugar or too much salt can cause high blood pressure and heart attack. We’ve all been warned time and again that too much sugar in the diet affects your health. It leads to conditions like type 2 diabetes, obesity, heart attack and stroke – just to name a few. But even if you make the utmost attempt to eat healthy, you may not be aware of all the “hidden sugar” sneaked into your food. And just one little bite of these sneaky food, can increase your risk of heart attack by a scary 18-50%. The hidden sugar we’re talking about that can cause high blood pressure and heart attack is in the form of ‘added sugar’. This, when consumed regularly as a part of the diet, increase the risk of heart disease by as much as 20 percent! It is a common practice for manufacturers to add sugar in different forms to improve flavor, appearance, and texture. The tough part is that people might not even be able to guess that they’re consuming a potential ‘sugar bomb’. Even those who are aware of added sugar will not really know how much it is in real terms. Here’s an example: A can of soda (we all know that’s the worst) has about 44 grams of sugar. A teaspoon holds about 4 grams of sugar. Do the math and you’ll realize that there are 11 teaspoons of sugar in a can and absolutely nothing else in terms of nutritional value! Grown up persons should not consume more than 20 – 36 grams of sugar per day and for children, the limit should be 12 grams per day. But added sugar is also found in big doses in savory stuff like ketchup and salad dressings. So the health benefits of the big salad you were so proud of having for lunch may be completely sabotaged. Quanhe Yang and his team of researchers in the Centers for Disease Control analyzed national health survey data and found out that added sugar made up 14.9 percent of daily calories in American diet between 2005 and 2010. Then they compared this data with the incidence of deaths related to heart disease. The risk of heart-related death increases 18 percent for those who received the average 15 percent of daily calories from added sugar, compared to diets containing little to no added sugar. Hi mates, its fantastic article about tutoringqnd fully explained, keep iit up all the time.